Oct. 3, 2018 - About two dozen teachers and more than 200 students – from middle and high schools to community colleges and incoming freshmen – came to the UC Irvine engineering campus this summer to participate in a variety of science, technology, engineering and mathematics (STEM) outreach offerings. All programs featured a hands-on, project-based educational approach, aimed at inspiring young people and encouraging their interest in STEM. “These summer programs act as a catalyst that creates invaluable dividends of inspiration and knowledge for motivated students whose talents are far too often overlooked,” said Sharnnia Artis, assistant dean of the Office of Access and Inclusion (OAI). Here is an overview from summer 2018. 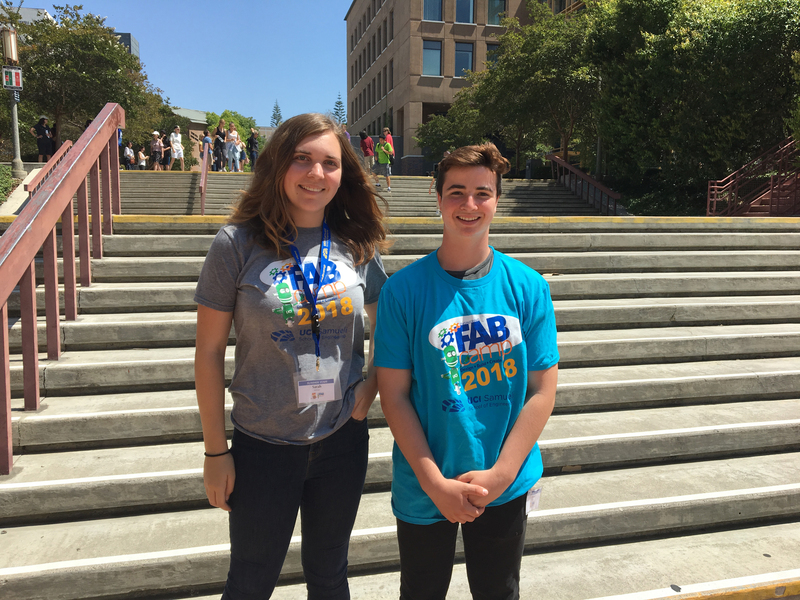 FABcamp, now in its sixth year, has developed from two weeklong sessions to six, with 1.0, 2.0 and 3.0 versions offered, as well as an opportunity for former campers to serve as interns. FABcampers in 1.0 learn about engineering disciplines from each of the Samueli School’s five departments; they end the week by building a hovercraft. Students also learn the basics of design using CAD software and how to bring their designs to life using 3D printing and laser cutting. In 2.0, campers learn additional tools in CAD and are introduced to Raspberry Pi and coding. The 3.0 camp is more open-ended. Students continue to work with Raspberry Pi and then learn coding with Python (text-based coding). They are taught how to wire and code several sensors and actuators using Pi. In teams of two, they chose a project to design, fabricate and code. At the end of the week, they presented their projects to their peers. Thanks to scholarship funds from the Broadcom Foundation, 19 students from Marco Forster middle school in San Juan Capistrano attended two sessions of FABcamp. Forster serves students from backgrounds with historically low levels of participation in higher education. Designed to ignite interest and expand the skills of students from low-resource communities so they can successfully pursue an education in STEM fields, these two programs are now in their fourth year at UCI. Forty-seven high school and community college students from 20 schools throughout California came to campus for the two-week programs this summer. Participants learned microcomputing via Raspberry Pi, coding and CAD, as well as how to use 3D printers and laser cutters. The students worked in teams of two to create their own invention using Raspberry Pi. They presented their projects at the closing symposium. In addition to this hands-on experience, the students had the opportunity to see the UCI campus and hear from faculty, students and staff in the Samueli School of Engineering and the Donald Bren School of Information and Computer Sciences about planning for college and making decisions on majors best suited to them. Now in its third year, the BASE 11 summer fellowship program aims to help high-potential, low-resource students succeed in STEM. Six community college students spent seven weeks on campus designing and building unmanned autonomous systems, or drones. Through a partnership with the nonprofit BASE 11, students in this program received a stipend and lived on campus while working on their projects. Ten incoming freshmen came to campus as OAI scholars for engineering boot camp. In addition to a project-based curriculum similar to the INSPIRE program, the scholars spent mornings in class, where they were taught material from courses they will take their first year, such as calculus, chemistry, physics and coding (MATLAB/Python). As part of a Center for Educational Partnerships program, 28 high school men of color participated in a one-day class at the school of engineering in which they learned about microcomputing via Raspberry Pi. Six instructors from Southern California community colleges and high schools spent two weeks at UCI learning how to incorporate the quadcopter design-and-build program into their curriculum. Sponsored by BASE 11, the program instructs engineering, math, science and manufacturing teachers in computer-aided design, fabrication and laser cutting so they can implement the popular hands-on approach with their students. This two-day training drew 18 teachers and staff from statewide MESA centers. The training combined the well-known Raspberry Pi academy model with a FABcamp project-based approach. Trainees learned to use Raspberry Pi and code with Scratch and Python and then to design with CAD. After mastering how to build and code basic Pi elements, they worked in teams, and with a random assortment of materials, built their own projects. Teachers and staff from all California MESA centers were invited to the training, where MESA curriculum was discussed at length.